Over the past ten years, enterprises have seen enormous gains in scalability, flexibility, and affordability as they migrated from proprietary, monolithic server architectures to architectures that are virtualized, open source, standardized, and commoditized. Unfortunately, storage has not kept pace with computing. The proprietary, monolithic, shared-all, and scale-up solutions that dominate the storage industry today do not deliver the scalability, flexibility, and economics that modern datacenter and cloud computing environments need in a hyper-growth, virtualized, and increasingly cloud-based world. 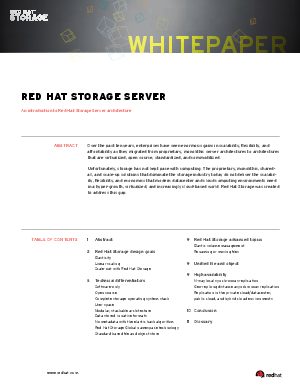 Red Hat Storage was created to address this gap.